Here's a guide on how to obtain high scores and complete stages in the mobile puzzle game Age of 2048: Civilization City Building (Puzzle) presented by Soulgit Games. 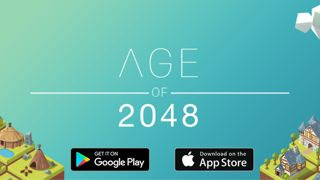 Based from the classic 2048 game (merge same blocks by using simple slides), become a city builder and discover various civilizations by unlocking new eras in the mobile puzzle game Age of 2048. 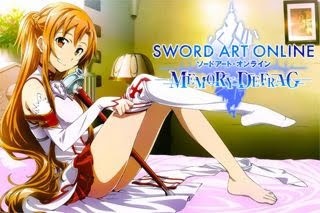 - Log-in everyday to receive various rewards like "Undo", "Magic Wand", and "Cleaner" options. - Undo = Go back one step. - Magic Wand = Upgrade any building that is not at max Lvl. - Cleaner = Removes all Lvl 1 and Lvl 2 buildings or trash blocks. - Continue below to learn how and when to use these options. - Get an item from the Power of Marketing! Tap on it while playing to receive more freebies after watching an ad. Get as much as you can to make your game easier. *Note that these bonuses can only be obtained while online. the right following a Snake-like path. - It doesn't matter which building, as long that it's higher than the next one. 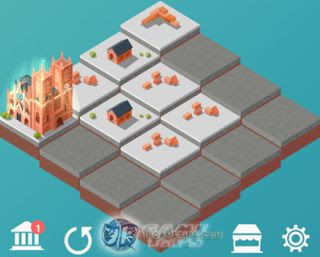 - If you want to start with this, quickly move the upgraded building to the left most tile. - Note: If you can't place move it there, just move it as close as possible then use the "Cleaner" option to remove those trash blocks. - Start and practice this one first, and also take note on when to use your options or items. - Never swipe UP! Consider this as a game over (but can still be fixed with options). - All buildings must be of higher Lvl than the ones on their right. So, if one of them is at lower Lvl than their left side building, you must navigate your way and try to upgrade that building asap. - If you have a chance to upgrade a building on the first lane with one from the back lane, then do it, but make sure to follow the Lvl pattern above. - Use on your highest building that is NOT maxed, to upgrade any or your highest building. This will also let you complete the game faster and easier. Best used at end game. - If you are having trouble upgrading a certain building, you can also use this to quickly fix it, but better use at end game. How About Swiping to the RIGHT? must fill the gaps (first lane) asap with any building or block. 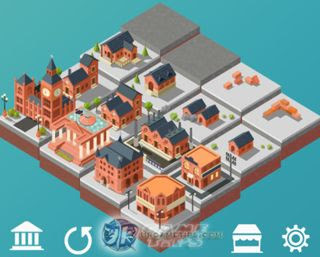 - So every time you swipe to the LEFT to upgrade your buildings, fill the gaps asap, but make sure to follow the tips above to avoid hard to fix mistakes. What If a Really Need to Swipe to the RIGHT? - This is still doable to fix, if you are still starting out, but it would be very difficult during mid or end game. - Use the "Undo" button then try your luck again. What If I Really Need to Swipe UP? - Now this is where things gets really really bad because it will probably disrupt the pattern. - If you are still at the early stage of the game, it can still be fixed, or just restart. use a "Cleaner" to remove all trash blocks. What If I Can No Longer Use Any Moves? trash blocks, then try to fix things again. If this happened because you weren't able to upgrade a certain building, use the Magic Wand too. - Only do this though if you are at mid or close to end game. - The pattern is the same above, but this time, the right most building should always be higher than the one on it's left. Plus, the bottom most building on the first lane must also be higher than the top one. - As long that the "Green Circled Building" above, is of lower Lvl than the one below it, then just simply continue towards the left following the same pattern as the first lane ("highest to lowest Lvl"). - If you have a chance to upgrade a building on the second lane with one from the back lane, then do it, but make sure to follow the Lvl pattern. - As much as possible, make that building or spot in-tact, so minimize swiping to the "Left" if you are working on the second lane. Quickly fill up the gaps to avoid this, but if you really need to, then hope that a trash block won't appear on that spot (can be fixed with upgrades or by using your options). - Got the pattern now? Yup it's just the reversed version of the first lane. - Your aim here is to upgrade this building then merge it to the first lane, but making sure that the next building to it's left is always of lower Lvl. This is a common problem here, but here's some tips to help you out. 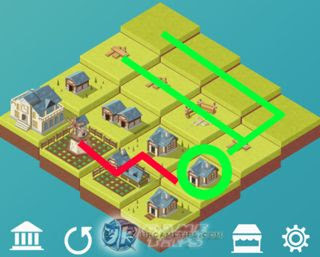 - First, navigate your way and upgrade the "Green Circled Building", refer the green lines above. 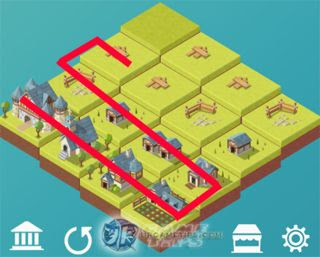 Continue until you are able to upgrade the building below it, but before that, also check if you can create combos by merging it into a high Lvl building on the second lane then to the first lane, refer the red line above. - Refer above FAQs if you need help about using options. Collect them still to help you fix or minimize error. Yup it would still happen at some point, since this game is also luck based. "Example Snake Pattern on All Lanes"
"Result After Merging All Buildings Back to the First Lane to Complete Stage"